B. Y. P. U. of Baptist Church Will Meet Incoming Trains. Preparatory to a campaign designed to reach all new Baptist students enrolling in the University this fall, the B. Y. P. U. of the Baptist Church is sending out letters to pastors of Baptist Churches in Missouri, asking them to extend a welcome for the local church to all prospective students who are affiliated with their respective churches. Gilbert James, president of the union, says that arrangements are being made to have church representatives at all incoming trains to greet students and give assistance in getting located. 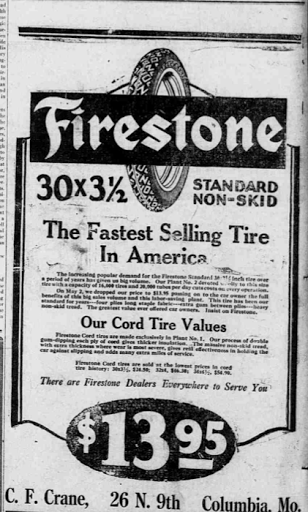 And a tire ad from Firestone. Yes, that's 3 1/2 inches wide! I understand the tires at this period were generally made with cotton cording inside and wore out much quicker than tires today. You can still buy Ford tires for your old Model T today.